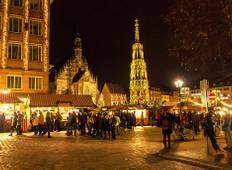 Find a Christmas & New Year trip that explores France And Germany. There are 23 tours to choose from, that range in length from 3 days up to 14 days. The most popular month for these tours is December, which has the most tour departures. "This tour does not cater for English speaking guests. Thank you Barbara for trying..."